Ever since my expat assignment in Kuala Lumpur (’07-’08) I’ve visited the capital of Malaysia on regular basis. Back in May 2010, I spotted the construction site of the Grand Hyatt Kuala Lumpur and promised myself to stay at the property as soon as it opened. 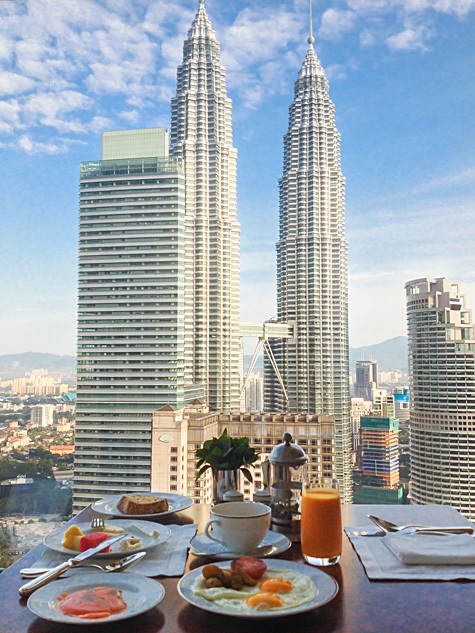 Located adjacent to the Kuala Lumpur Convention Center, the Grand Hyatt offers amazing views on the Petronas Twin Towers…at least if your room faces the KLCC park. The rate for my one night stay was quite steep at MYR678 (€171) compared to other KL Hotels, but as Gold Passport Diamond member I could use one of my Suite Upgrade Certificates to exchange a Grand King room (47-sqm) for a massive Grand Corner Suite (105-sqm). At check-in around noon, I was originally assigned Grand Suite 3321 which was not facing the Petronas Twin Towers. After contacting the font desk, I was able to move to Grand Suite 3109 facing the towers. One of the highlights of my short stay was lunch at Grand Hyatt’s signature restaurant THIRTY8 located on the, you guessed it right, 38th floor. The service, the food and the view… just amazing! Similar experience at breakfast at the Grand Club on the 37th floor and again what a view!